Becca Hubbard-Woods has been a freelance writer since 2005, writing for various online publications. She graduated from San Joaquin Valley Junior College with an Associate of Science in medical office administration, and achieved a Bachelor of Science in health administration from the University of Phoenix. Filet mignon is a cut of steak that comes from the eye of the tenderloin. When prepared properly, the filet mignon is so tender that it can be cut with a fork. Although the steak is incredibly tender, it lacks the full flavor of other cuts of beef that are closer to the bone. For this reason, the filet should be seasoned lightly so the mild flavor isn't masked by bold flavored seasonings. Searing the filet will seal in the juices, while finishing it in the oven will ensure the tenderness of the meat upon completion of cook time. Preheat an oven to 475 Fahrenheit. Season the filet mignon with salt and pepper on both sides and allow the meat to sit at room temperature for 30 minutes before cooking. This will ensure the meat cooks evenly throughout. Heat 2 tbsp. olive oil in a skillet to medium-high heat. Place the filets in the oil and sear for two minutes per side, until golden brown. Immediately move the skillet to the oven and cook for two to three minutes for rare, four to five minutes for medium and five to six minutes for medium well. Alternately, use the meat thermometer to check the internal temperature during cooking. A rare center will read 120 to 129 degrees Fahrenheit, a medium center will read 145 to 150 degrees and a medium-well center will read 150 to 155 degrees. Remove the skillet from the oven. Allow the meat to rest for 10 minutes before service, allowing the juices to settle into the meat. 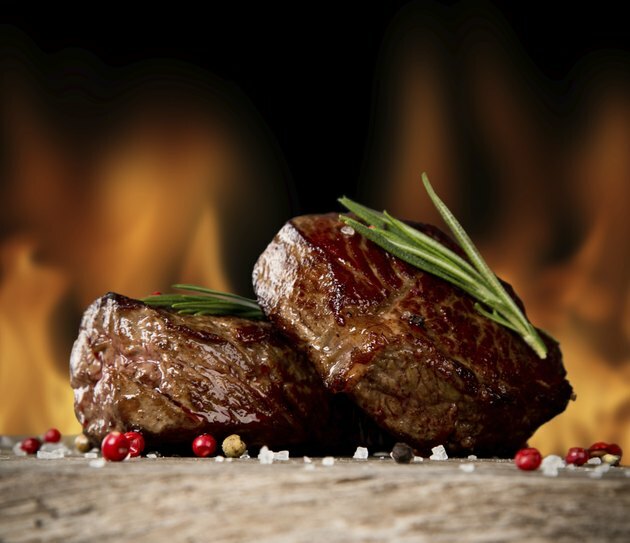 It is not recommended to cook a filet mignon above 155 degrees Fahrenheit, as this will decrease the natural tenderness of the meat. It is common to wrap the filet mignon in bacon before cooking to add extra flavor to the meat. Use oven mitts to remove the skillet from the oven to avoid serious burns.